Just about all of us who've spent any time in a kitchen are familiar with backsplashes. Basically just a way to keep the wall behind your sink or stove safe from the splashes of liquid that happen while you're cooking or cleaning, a backsplash is mostly just a small functional piece your kitchen. But from a design perspective, backsplashes can do a lot. They can bring color, pattern and a surprising amount of personality to a kitchen's interior. Because of that they've become a big focus for designers as well as magazines, websites and blogs. But in your own home, how can you make sure that you're getting the most out of your backsplash? Well, here are a few tips. One of the best ways to get more out of your backsplash is to simply have more of it. Spread out from behind your sink or your stove and use the backsplash to define the whole room. In this kitchen, the tiled backsplash covers everything around the room from the countertop to ceiling, taking the backsplash beyond its basic function and turning it into a textured statement wall. Like bathrooms, kitchens are very much functional spaces, which means that you may have to look a little harder for your decorating opportunities. When in doubt, your backsplash is a great place to start. Even when they have strong patterned elements, backsplashes often come in muted or neutral colors. Instead, take the opportunity to make a strong contribution to the mood and color story of your kitchen with a backsplash that makes a colorful statement. Not only will it strengthen the impact of your space, it can also reduce the amount of additional work and expense that would come from adding additional elements such as wallpaper or large art installations. Kitchens can be very cool environments. Stainless steel appliances and stone countertops are beautiful, but it would be hard to describe them as "cozy." A backsplash done in warm colors can do wonders to bring a sense of comfort to your kitchen. Here, without dominating the space, this basket weave-inspired backsplash brings a warm note to the entire room, while drawing the eye with its interesting pattern. On the other hand, if your kitchen has its share of warm notes coming in from cabinetry or other elements, create a bit of contrast with a backsplash done in stainless steel. 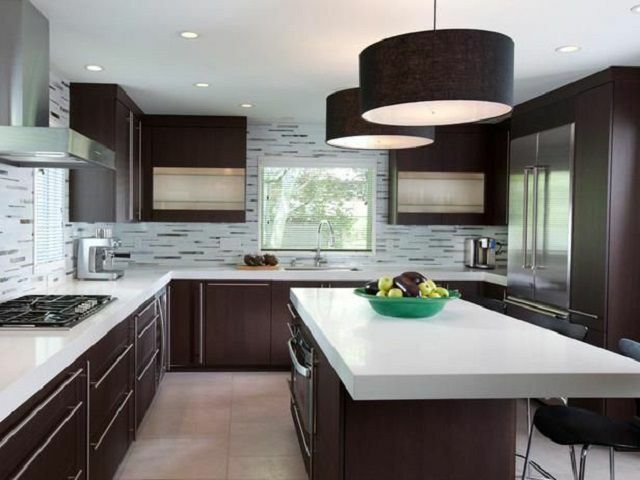 In this kitchen, stainless steel subway tiles create a stunning backdrop with a futuristic twist. If you've got a high ceilings, don't be afraid to take your kitchen decor to the very top. Use your backsplash to create a vertical wall statement that draws the eye in and up. This is especially useful in smaller kitchens where the sense of verticality can do much to combat the feeling of being in cramped quarters. More than anything else, the one thing you can do to ensure that your backsplash is helping to create a beautiful kitchen space that you'll be happy to spend time in is to bring in your own sense of creativity and personality. Break out from traditional tile backsplashes and brick-style patterns and explore.